I honestly can’t imagine a riskier film then The Curse of the Black Pearl (COTBP). It’s based on a theme park attraction, and none of Disney’s other theme park attraction films were ever any good or even broke the bank. I think my family went to see it out of curiosity primarily, and what I learned was that the movie is based on the attraction in name only. The movie is 100 percent original, with homage’s here and there to the theme park ride that simply add to the fun of it all. Ted Elliot and Terry Rossio, the creative team behind the original Shrek film, along with two other writers, created this story from the ground up, and it is a vast saga that encompasses all the best elements of Pirates and turns it into an unmistakably original and virtually flawless film that can be rewatched over and over without ever losing its fun. The plot feels clichéd but is executed in such a way that it feels greatly original. The Pirate crew of the black pearl comes to raid the Navy town of Port Royal, looking for a gold medallion. The governor’s daughter, Elizabeth Swann, just so happens to own this medallion, and is kidnapped by the pirates. 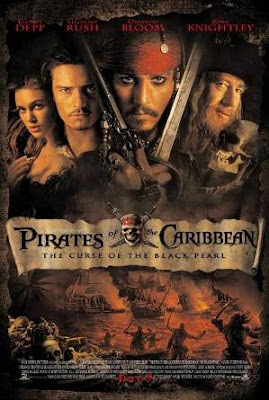 The local blacksmith’s apprenctice, Will Turner, has a deep love for her, and will stop at nothing to get her back, even teaming up with scalawag and pirate Jack Sparrow. Elizabeth soon learns that her pirate kidnappers are cursed, and whenever there is moonlight, they turn into skeletons. That makes it very hard for Jack Sparrow to get his revenge on Barbossa, captain of the Pearl. It’s a long, sprawling plot that takes two and a half hours to tell, but never feels long. It actually goes by quite quickly, due to the fun sets, shiploads of action (excuse the pun) and Johnny Depp’s brilliant performance as Jack Sparrow. Depp has said the Sparrow is his favorite role, and it shows on screen. All actors seem to be having fun in their roles, but Depp is obviously having a ball, and steals the show. You can never really tell whose side he’s on; he’s a selfish scalawag who only does something if there’s something in it for himself, but that’s what makes him such a fun character. It’s no surprise he got an Oscar nomination, and if the Academy voted actors on how fun they are to watch, he would have swept all the competition away easily. Geoffrey Rush plays one of the most effective villains I’ve ever seen as Hector Barbossa. He talks and acts like a perfectly pleasant guy, but you’ll be hard pressed to find another villain in another movie that is so obviously evil. When he and Johnny Depp are on screen together, its almost too good to be true. The rest of the acting isn’t as good, but the actors hold their own against these two behemoths. Orlando Bloom plays Will Turner, and does an excellent job. This was the first time we saw him in more of a leading role, and he does a fine job, though not nearly as good as he would eventually do in Ridley Scott’s Kingdom of Heaven. The weak spot in the acting is Kiera Knightley as Elizabeth Swann. She does a good job that is perfectly passable, but seems out of her league. She’s about a dozen times worse in the film’s sequel, but in this film, she’s simply okay, and a bit underwhelming given the rest of the film. The action scenes are all top notch, edge of your seat entertainment, enhanced greatly by Klaus Badelt’s epic and insanely fun musical score. Whenever I think of Pirates in any form, Badelt’s musical themes begin playing in my head. The music is just as fun to listen to outside the movie, and makes the film twice as riveting as it would be without the score. It’s like what John Williams did for Star Wars; this wouldn’t be half as good without this exemplary musical score. There’s really not much more to say about the movie. It hooks you from its first moment and doesn’t let go until the credits roll. It’s one of my all time favorite films, and a true modern classic, the best work Disney has put out in over 10 years. COTBP is virtually flawless, and of all the movies in my DVD collection, I’ve probably watched it more then all the others. Many say it’s an overly long film, but I couldn’t disagree more. Its popcorn fun at its very best, and you won’t find a more entertaining piece of Pirate lore anywhere else.